Why is it always more comfy wearing an oversized hoodie? Because all that extra room makes thing extra cozy. And having one that covers you all the way up like a blanket? 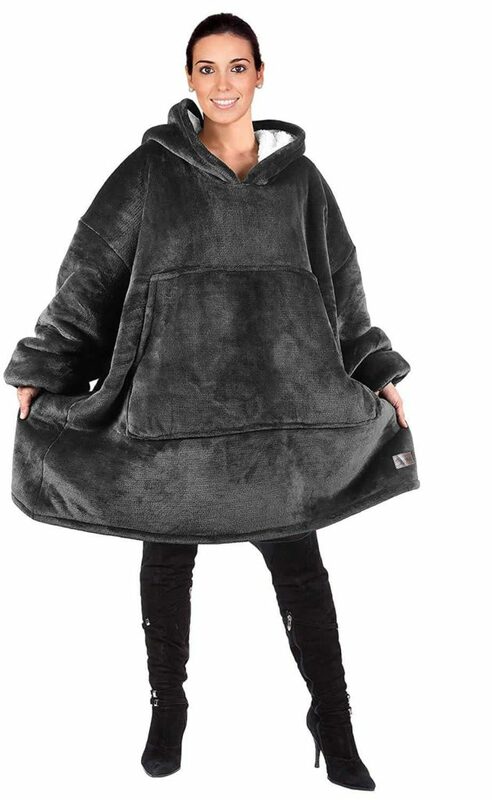 That’s the ultimate coziness, you can only get from the sweatshirt blanket. 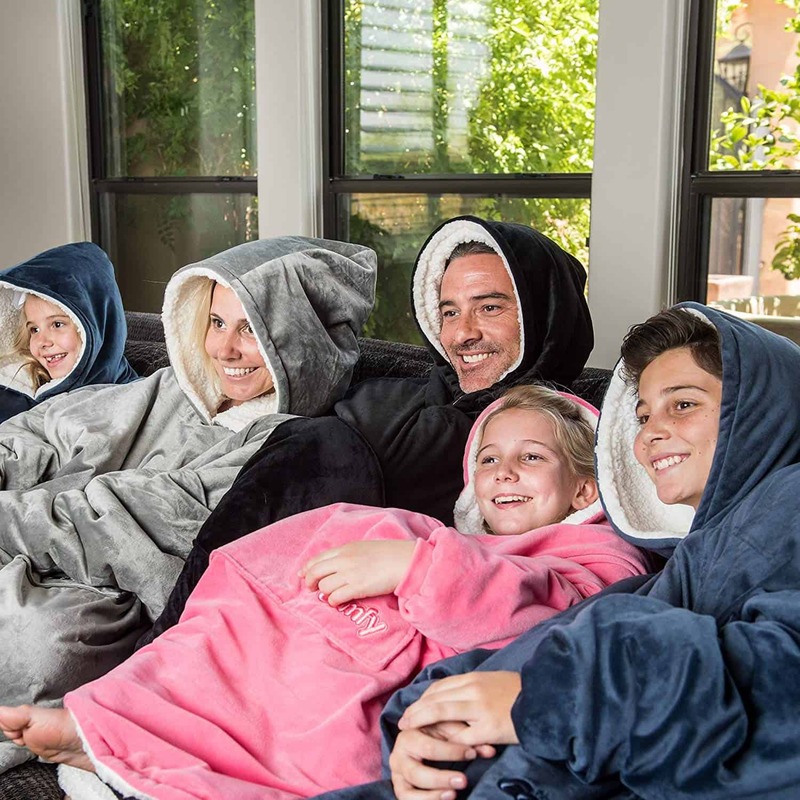 The original blanket sweatshirt called The Comfy, premiered on a successful shark tank episode. It took the world by storm with it’s ultra plus design, soft hood, and handy pocket. It’s inspired a few copycats too, and today we are uncovering (see what we did there) which one makes the best sweatshirt blanket! The Comfy is the original sweatshirt blanket, with a luxuriously soft design. It feels amazing with a velour like microfiber, that’s ultra plush to the touch. It’s also reversible, and the inside lining is made from a cozy sherpa material. Another cool thing about the Comfy is that it comes in a wide variety of colors perfect for anyone. One of the best reasons to buy the original comfy, is that it was created by two brother entrepreneurs. When one saw their son wanted to use his father’s old oversized sweatshirt as a blanket, he knew he was on to a good idea. After successfully funding the project on Shark Tank, their product became a viral sensation, and we owe them big time for starting this comfy trend. Reversible, Velour Microfiber outside and Sherpa inside. 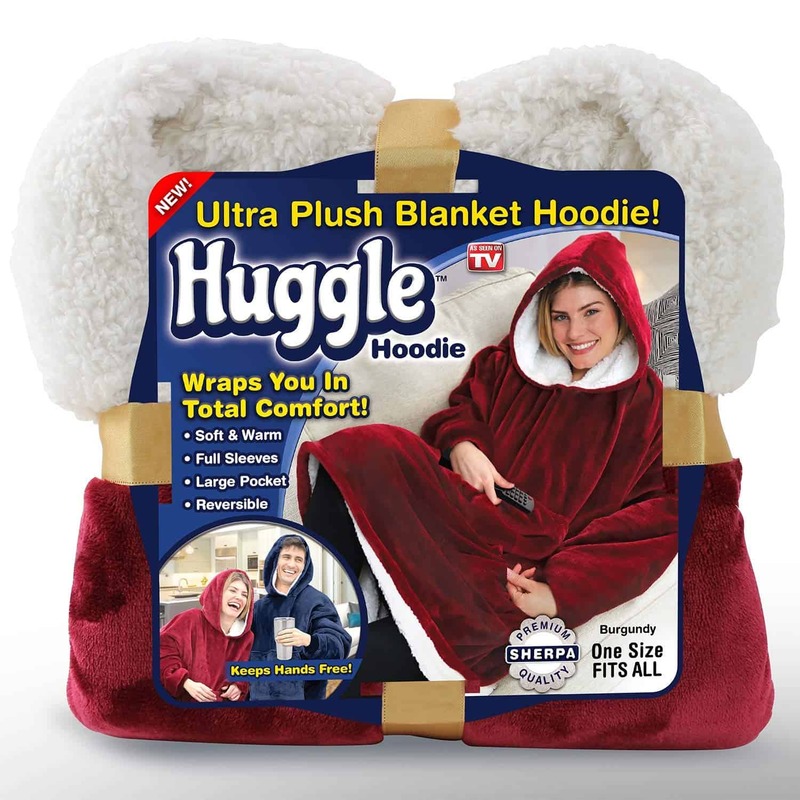 Similar to the Comfy, the Huggle is the “As Seen On TV” version of the sweatshirt blanket. It comes in two festive colors, deep burgundy, and a nice navy blue. It’s got all the same features as the Comfy, but with slightly lower quality materials. For most people this doesn’t make too noticable of a difference, and the lower price point is A-OKAY for them. The Huggle makes a great gift because it’s not too pricey. It’s seen as a fun novelty item that’s great for people of any age. It also has a oversized hood and pocket, and is machine washable just like the original: The Comfy. Reversible with Microfiber outside and Sherpa inside. The Catalonia is another great pick for best sweatshirt blanket. It has many of the same features as the other two hoodie blankets we covered, but comes in some really lovely colors. The Catalonia sweatshirt comes in teal, pink, and even a cool plaid red print that’s perfect for the holiday season. It is made from a cozy microfleece material that’s a bit thicker than the Comfy, and it’s lined with Sherpa like the others. 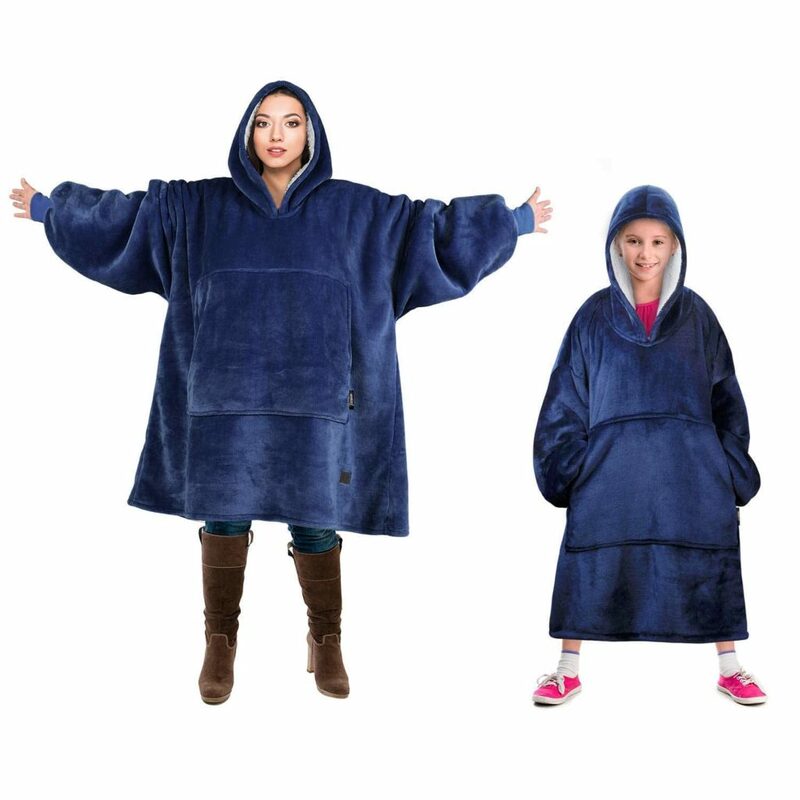 This hooded blanket also is also reversible, with a giant oversized pocket perfect for stashing the remote. Like the others it’s also one size fits all, and makes a fabulous gift for anyone on your list. Reversible with Thick Microfiber outside and Sherpa inside. The Tirrinia Blanket Sweatshirt has all the important features of our other contenders, plus one that may be very helpful: Elastic sleeves. The sleeves on this hooded blanket can be pushed up and stay, which is pretty handy if you’ll be eating or doing any other activity. With any of the other blankets you could roll them up, but having elastic sleeves is more convenient. Additionally the Tirrinia blanket sweatshirt comes in a variety of fun colors, with the same minky microfiber outside and sherpa inside. 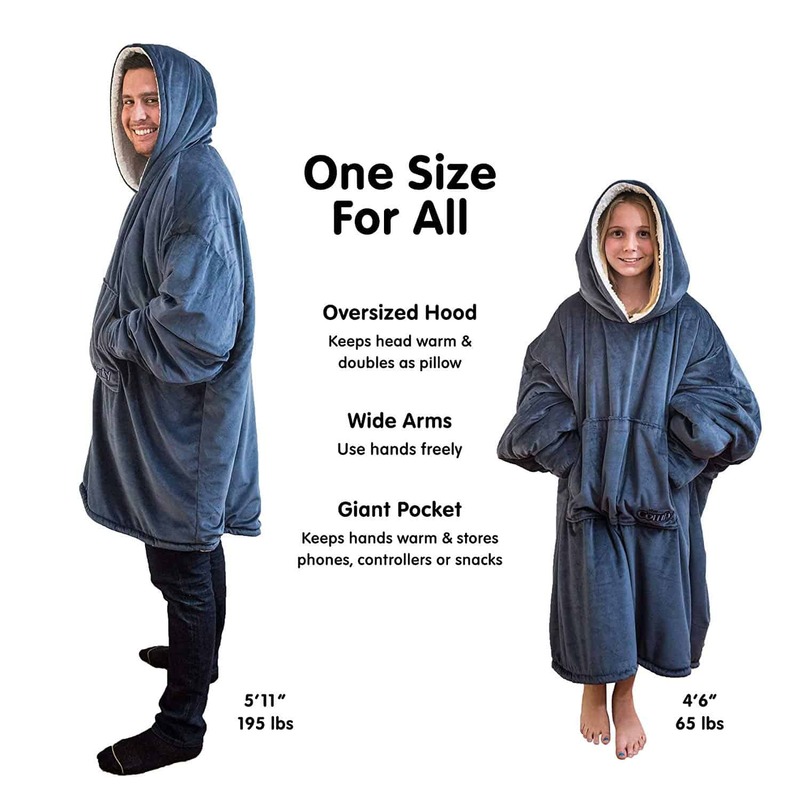 It’s also machine washable, with a cozy hoodie and oversized pocket. It’s a better pick for people who still want to be active while wearing their blanket sweatshirt, since the elastic bands keep your sleeves out of the way. Which One is The Best Sweatshirt Blanket? Overall, The Comfy is the best pick for sweatshirt blanket. Why? Because it’s material is high quality, it comes in the biggest variety of colors (over 9 to choose from) and it’s guaranteed not to lose its shape or color after washing. To top it off, it;s great to support the originators of this fabulous product. If you’d like to save a couple bucks, or if these will be given as gifts or not used too often, any of the other choices will also be great! Here are a few ideas for who should use the sweatshirt blanket. Who Should Get The Sweatshirt Blanket? You could totally use a sweatshirt blanket if you’re..
We hope you enjoyed this review of the Comfy and the other sweatshirt blankets. They make lovely gifts, and they’re so cozy you’ll never want to take them off. Just give yourself a quick reminder not to be sad when you (eventually) have to wear real clothes again!